So of course- the new Census of Marine Life has some amazing deep-sea critters! This is the first global Census of Marine Life- it’s an accumulation of marine creatures over 10 years of marine exploration by over 2700 researchers from 80 different nations. The Census not only shows that the ocean is much richer than thought before, but it is also more vulnerable and interconnected than previously thought. Basically stating that the marine creatures are a lot more susceptible to changes in the environment- climate change for example. Even though this Census is huge, there is so much of our oceans unexplored that the Census numbers can only go up and up! Well this little fella still has yet to be named. 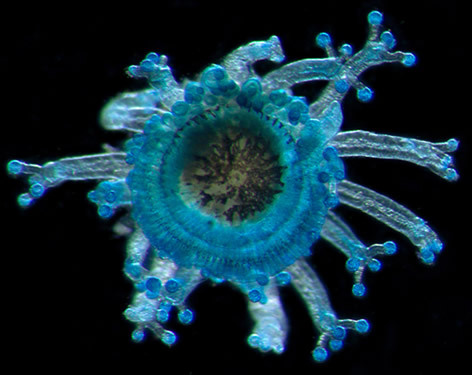 It’s an example of a colonial jelly-where its dark blue color helps protect it from the sun’s UV rays. This particular jelly pictured is only 3-4 mm wide. 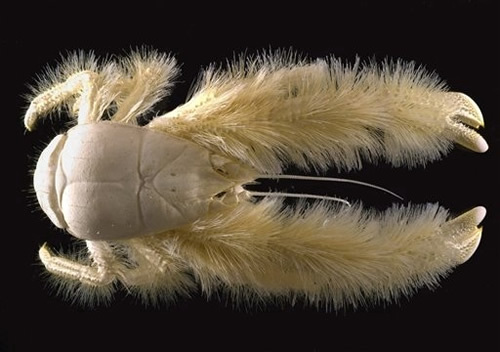 The yeti crab is pretty cool, but the pistol shrimp is still my favorite marine creature. Hot as the surface of the sun? Sounds like overkill. Apparently it works, though.